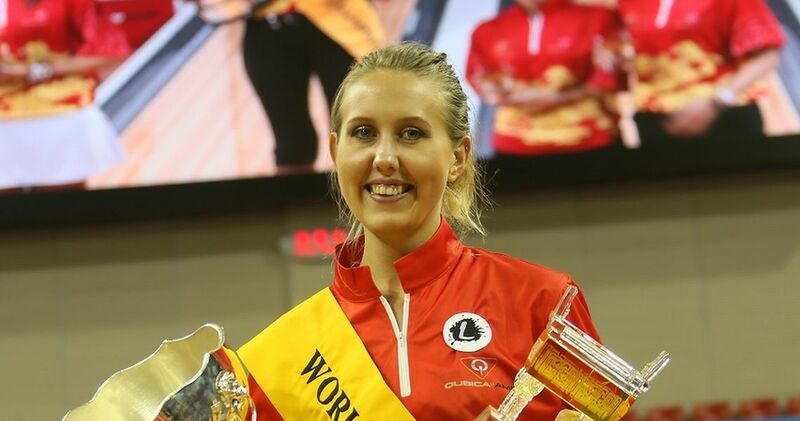 Jenny Wegner from Sweden defeated Team USA’s Danielle McEwan, 231-204, to win the women’s title in the 52nd QubicaAMF Bowling World Cup Saturday afternoon in a two-lane arena in the Luwan Sports Complex in Shanghai, China. Wegner (pictured above and right) became the third Swedish women in the 52-year-history of the event to win the title. She followed in the footprints of Asa Larsson, who won 27th edition in Beijing, China, in 1991, and Annette Hagre who swept the titles with Peter Ljung at the 22nd edition in Copenhagen, Denmark, in 1986. Wegner started the title match with a double and a spare to take an early lead in the title match. She fell behind after failing to convert a baby split (3-10), but rebounded with four consecutive strikes. The Swede spared the 3-6-9 combination in the 9th frame and sealed the victory with three strikes in the 10th frame. In the first semi-final match, Wegner, the No. 4 seed, ousted tournament leader Bernice Lim (left) of Singapore, 224-207. Both players struck on each shot on the right lane (Wegner only the first in the 10th frame) but the left lane made the difference. Lim had two splits which she failed to convert, while Wegner converted two spares. In the other semi-final match, McEwan, seeded second, topped No. 3 Syaidatul Afifah (right) of Malaysia, in a high-scoring affair, 248-236. The Malaysian, who had the highest series in the Round of 24 and Round of 8, took an early lead with three consecutive strikes in frames 3 to 5. McEwan (left) countered with six-bagger from frame 5 to 10, which put the match out of reach for Afifah. The 52nd QubicaAMF Bowling World Cup was held from October 14-23 at Hao’s Bowling in Shanghai, China. Bowlingdigital.com provided onsite coverage of the 52nd QubicaAMF Bowling World Cup from Shanghai including reports, photos and results after each round. The United States Bowling Congress provided live streaming on BowlTV. 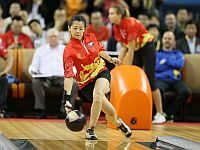 The 81 men and 63 women from 83 countries bowled 20 qualifying games over four days before the field was cut to the top 24 for eight additional games. The 28-game pinfall totals determined the 8 players who advance to eight games round-robin match-play (30 pins for each win, 15 for a tie). The top 4 players with highest 36-game total including bonus pins advanced to the playoffs, which were staged on a specially constructed two-lane arena in the Luwan Sports Complex which is also where Hao’s Bowling is located. The finals were covered by live streaming on BowlTV and local Chinese live streaming through Ali Sports. There were one-game knockout matches with the No. 1 seed versus the No. 4 qualifier and No. 2 versus No. 3. The winners of each match earned a spot in the championship game. Championship Match: Wegner def. McEwan, 231-204.